Kearsten LaBrozzi, from the Glendale Public Library, occasionally puts together Booktalks for us here at TLT. I’ve collected all the posts on Booktalking in one place for you. Don’t forget to check out the works of Joni Richards Bodart, who graciously wrote a chapter in the forthcoming The Whole Library Handbook: Teen Services for Heather Booth and myself. She has a wide collection of Booktalking titles that you can check out and use, they are an invaluable resource. Before I can tell you about the best teacher I ever had, I have to tell you about the worst. I started a new school in a new state in the 9th grade, my first year of high school. My English teacher that year had just returned from teaching English in Japan. She really loved Japan. I know this because that year she taught us so very much about the Japanese culture, but so very little about English. So when I started English in the 10th grade, I was lost. Utterly and tragically lost. I couldn’t diagram a sentence. I couldn’t label the parts of speech. I could not fix your clause or identify your dangling participle. So 10th grade was also a nightmare, but it wasn’t that teacher’s fault. But in the 11th grade, the curtain of fog lifted thanks to one Mrs. Harris. I loved her. She taught me all of the things I was supposed to learn in 9th and 10th grade. But most importantly, she made me read To Kill a Mockingbird by Harper Lee. That book changed my life. That year changed me. Seeing myself turn around and be successful at a subject that I had struggled with helped me gain confidence not only in myself, but in my future, which begins to really loom heavily over you in the 11th grade. Sometimes all it takes is one teacher. Standing in front of a classroom and doing the same lesson for 6 to 8 periods in a row is exhausting. It’s physically exhausting. It’s emotionally exhausting. It just drains you. Without fail I would announce to my husband that I was going on that morning to do booktalks and we both knew it meant I was coming home at the end of the day to take a nap. Teachers have to be constantly “on” in ways that many people don’t in their jobs because you can step into the bathroom when you need to, or get a quick drink. Standing in front of a classroom is kind of like being on stage for multiple shows in one day. Teachers enter the building before they will even teach a moment in their class and do things like facilitate drop off, pass out breakfast, monitor recess and lunch, and more. Every day when I run the drop off and pick-up gauntlet at my Tween’s school I am always impressed to see a teacher standing in the rain with cars moving on both sides of her while she holds a slow/stop sign to help make sure students get inside the building safely during this heavy traffic period. They signed up to teach a subject in a classroom and end up doing so much more, including being mentors, guidance counselors, safety officers, peace keepers and more. And then after they have spent the day navigating through the issues of students, they have to navigate through the professional and administrative portions of their jobs. It was clear each and every time how much these students appreciated their teacher. She worked hard to teach them. They learned things. They participated. And when I came, they also valued that as well. I was impressed each and every time to see these teens in the classroom environment and honored to get to know them and get to share this time with them. When you show genuine interest and respect to teens, they often return the sentiment in kind. What we know about development, the human brain, about science and history . . . these things are always changing. And as our knowledge of the world we live in changes so to must teachers. Teachers are required more so than many other professions to continually participate in continuing education and professional development. And because we are so invested in our children, there are incredible outside demands made on teachers, often by individuals who have no real practical or theoretical knowledge of education or what happens in the classroom. Today more than ever teachers are trying to be heard over a variety of outside influences, many of whom have more of a financial interest in education than any real concern about the individual needs and personalities of the kids and teens actually sitting in a classroom. Teachers have important jobs and they go through specific education and training to become accredited to teach. Teachers learn about development, learning styles, building curriculum and more. Plus, they have to learn the content matter of the grade level or subject areas that they are teaching. We all have moments in our lives where we teach – we teach our children to tie their shoes or we teach a patron to set up an e-mail account – but that does not in any way encompass all that it means to be a licensed teacher in today’s school setting. Being a good teacher is a not only a skill, but I believe it is a gift and a calling. I remember playing school as a little kid and wanting to be a teacher when I grew up. The truth is, I believe I am doing exactly what I am supposed to be doing as a YA librarian, and it lets me do a lot of the things I wanted to do when I dreamed of being a teacher, mainly helping teens. As a mom, I have had my issues with my kid’s teachers: I have questioned assignments, I have been disappointed in the way that individual issues have been handled, and I am deeply dissatisfied with the amount of time spent showing movies at my child’s school. But I have also had many moments as a librarian where I have been inside the schools on the other side, and that is a unique and challenging experience. I am thankful every time a teacher invites me into their classroom because I know that their time is precious, as are their students. Though storytelling comes in all forms, I tend to spend the majority of my reading life with fiction told from a 1st or 3rd person point of view, and a “first this happened, and then this, then this…” chronology. Yes, these stories are often wonderful, but I find that sometimes it’s intriguing to mix things up a bit. The following books all tell their stories differently, whether by playing with style, point-of-view, or format, but they’re all guaranteed to catch the attention of older teens (and adults)! “You’re surprised at all the blood.” So begins You, a suspense story with a twist: it’s told in 2nd person, meaning that you, the reader, feel as if you’re Kyle Chase, a 10th grader with an “aptitude” for math and a crush on Ashley. You hate your school, and wish you could go back to eighth grade, to work harder for the better grades needed to get into the school all your friends did. Instead, you’re stuck at Midlands High, where you end up hanging out with the kind of guys who sneak out at night to smoke, steal beer, and break into your old middle school. And then, one night, you’re covered in blood and someone is dying. But how, exactly, did you get there? What about poetry? Do you have a group of teens obsessed with Ellen Hopkins’ dark verse novels? Why not give them family by Micol Ostow? Ostow took the true story of the Mason Family cult and murders, and told that story from the point of view of a person on the inside. Mel, a seventeen-year-old self-described “broken” girl, finds solace and companionship in the charismatic Henry. Through Mel’s eyes, we begin to see the ways in which Henry, as a collector of “broken” people, uses and manipulates his devotees, Mel included, to carry out horrific acts. This is an unsettling story, but powerful in the way it forces the reader to understand how a person looking for acceptance can be led down a very dark path. This final book, Chopsticks by Jessica Anthony and Rodrigo Corral, has the least amount of text of all the books here…and it’s the most mind-blowing, in my opinion. Glory Fleming was a brilliant piano “prodigy,” destined for greatness and sold-out performances. So why has she gone missing? And what led to her Chopsticks-obsessed breakdown? Through photographs, drawings, and newspaper clippings, follow the story of a girl who fell in love, and then lost her mind. Then reread the story, in order to find out what *really* happened. What are your favorite nontraditional format books? Share with us in the comments. With only a few minutes and a couple dollars, you can do some really creative and engaging things. Check out these ideas, take a look around your space, grab some sticky notes and see what you can do! Encourage teens to write poems to share on a wall or window, or encourage them to copy favorite lines and share them like the Durham County Library did. 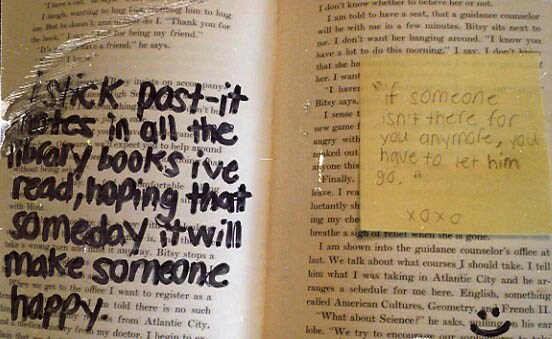 Stick secret notes into favorite books for teens to discover, or add to. Reading is social, even if it’s secretly social as this Post Secret submission reminds us. Get some heart shaped notes and stick them on book covers for a Books We Love display, and add a line or two about why you love the book. This could also work for star shaped notes to highlight Award Winners. Nyan Cat! Stacey at the Naperville Public Library explains how she did it, but you could use the technique for any other pixel art project you can think of. Use them to write crib notes to yourself when you do booktalks. It’s easier than note cards because it’s less to hold and allows you to pick up any book and instantly have your notes attached. I can’t be the only one who can never remember how old characters are, or needs a few key words to jog my memory of the fabulous hook I want to leave for teens, right? Got some more good ideas? Share ’em in the comments! March is a big month for picture books, as many elementary schools celebrate Dr. Seuss’ birthday with Cat in the Hat costumes, green food-coloring and Read Across America. Why not remind your teens of the fun of picture books by recommending some they might have missed? This is the perfect time to display those somewhat edgy titles that you may skip for storytimes, but will delight your teens! Do you have a teen that enjoys twists and unexpected endings? Jon Klassen’s picture books, I Want My Hat Back and This is Not My Hat, starring a determined bear and a possibly doomed fish (respectively), are just a little bit twisted and completely entertaining. Remember Lane Smith’s It’s a Book, which shocked the library world a few years ago with its ending page? Our teen library council still requests the book trailer at parties (they love shouting out the ending line). And love stories don’t get more tragic than that of the tadpole and the caterpillar in Tadpole’s Promise by Jeanne Willis, illustrated by Tony Ross. What about the budding artists among your teens? From Caldecott Award winners and honors to the un-nominated, show them a variety of formats, like colored pencil drawings in Emily Graves’ Blue Chameleon or torn paper illustrations in Ed Young’s Seven Blind Mice. After taking them through Eric Rohmann’s precise and boldly-outlined relief drawings in My Friend Rabbit (I’d frame so many of these pages if I could bear taking the book apart! ), Catherine Rayner’s loose lines and layered blocks of watercolors in The Bear Who Shared, and Chris Haughton’s pencil and digital media drawings (plus an unusual color combination) in Oh No, George, your artistic teens will find something to inspire their own creations. Picture books are a great way to remind teens to have fun with what they read – and that picture book reading doesn’t need to end once you’ve started chapter books! Share your favorites, encourage them to reread books from their childhood, and who knows: maybe one of those teens will create picture books of their own someday! One of my teens making a match! A few weeks ago, I read about the YALSA (Young Adult Library Services Association) summer course entitled Making the Match. I decided to email the instructor for this course, Teri Lesesne, to see if she would be interested in writing a guest post for us. Teri is @professornana via Twitter and is a professor of library science at Sam Houston State University in Texas. See what she has to say about why finding the right book is important and if you are able, I encourage you to take her course offered through YALSA! The difference between the right word and the almost right word is the difference between lightning bug and lightning, to paraphrase Robert Frost. The same is true when it comes to matching a reader and a book. Coming close is not enough particularly for teens who might be less than enthusiastic readers. Finding the right book requires knowledge, skill, and sometimes a bit of luck. What elements are important in this process? A first and often overlooked step is to have a thorough working knowledge of the readers we wish to assist. In the case of tweens and teens, we need to know how they develop intellectually, morally, and developmentally. We need to understand aspects of their culture. I confess that I did not always consider some of the theorists I studied in college. How did Maslow and Piaget and Havighurst and Kohlberg factor into helping readers find good books, books that would speak to them leaving them to demand more? Where readers are in terms of their development can often affect responses to reading. The second step in matching readers and books relies on a knowledge of the books themselves. How could we ever hope to find the right books unless we are reading dozens if not hundreds of books for tweens and teens? Have we read selections from the YALSA lists? Have we scanned the bestseller lists for titles we do not know? Have we read the movies made from books? Are there other places we can turn for suggestions of the books we should read? Finally, matching readers and books requires we have an arsenal of strategies for getting books into the hands of the readers. Booktalking is certainly key here, but how else can we let readers know about the really good books even when we are not available for booktalks? Shelf talkers, blogs, bibliographies, displays, and more are key strategies, too. Seems simple on the surface. However, we all know it is a complex and demanding task: finding that just right book. This summer I will offer a course through YALSA called Making the Match. We will spend 6 weeks talking and sharing and learning together. I hope some of you will join me. Information about the course is on the YALSA site (http://www.ala.org/yalsa/onlinelearning/onlinecourses/making_the_match). In the meantime, grab a book and read! What does every librarian love? A captive audience! You want to get into your schools, into the classrooms, and develop relationships with your teachers. One of the best ways to do this is to develop a booktalking program. A booktalking program can be an effective tool in your school/library relations toolbox. What you want to do is develop relationships with teachers who will keep you coming back again and again into their classroom to introduce new books to their students. It can be once a month, once a grading period, or at the very least before winter and summer breaks. So you have to sell yourself to the teachers to get your foot in the door, and then you have to deliver the goods. Do some research and put together a really good introduction to your area teachers about booktalks. Let them know what booktalks are, why they want to let you do them, how they support the curriculum, and how they encourage students to read. Make it short, simple and visual: you are marketing a service to them. An example 3-fold brochure follows . . . I created this brochure over the years based upon my own MLS final project which focused on booktalking. In addition, I gathered feedback from students and teachers over the years to help me sell the program. Always remember to save positive feedback to use in future marketing materials. I have always found that teachers and students both respond favorably to booktalks and their feedback helps me sell the program. Your basic selling points are this: Teens find that reading is more enjoyable and are more likely to finish a book if it is a book they select for themselves, booktalks introduce teens to a wide variety of books and allow them to make those successful choices, and booktalks increase reading pleasure. Booktalks = more reading success, more reading variety, and more reading enjoyment! Plus, it will help move items in your library. Thus, booktalks = increased circulation. Wait until the second or third week of school and send a letter of introduction and brochure to each Language Arts/English teacher and each school librarian. Ask the school principals if you can have a few moments to speak at a teacher in service day and give some example booktalks. Do everything you can to get your foot in the door, then wow them. Start out by creating for yourself a basic building block of say 20 booktalks of the best teen books that will reach the greatest audience. Be sure to write your booktalks, practice them, and keep them readily available. As you read a book, create an electronic file (or an old fashioned index card if you would like) that gives a basic description of the book, the appropriate audience, and a “hook” for that book. What is it that will help you sell this book to teens? You want to include a wide variety of books and talking styles, including some Booktalk 2.0 styles (included below in Tech It Up). You’re a librarian, you can always borrow! Honestly, I am not a funny person (well, not intentionally any way). I can never even remember the punch line to a joke. So I don’t try to do funny booktalks. Teens would see right away that I am out of my element. In order to sell a book, you have to be authentic. Don’t try and sell a book you hate. Don’t try and sell a book you know nothing about (really, you should read it). And don’t try to be something that you’re not. You want the teens to trust you because you are trying to get them to do something . . . so be authentic. Trust is vital. However, you need to be able to employ a wide variety of styles. Booktalking expert Joni Bodart discusses the different types of booktalks as being character based, mood based, plot summary, or anecdotal. Find out what motivates the story, and then figure out your hook. From there, you can engage in a wide variety of booktalking styles and techniques. There are other places that cover that topic well. You need to know these names Joni Bodart (check out her books), Nancy Keane and Naomi Bates. They will help you develop the tools you need to be a successful booktalker. Remember, in the ideal scenario you will go to a teacher’s class and booktalk to each and every period. This means that you can be entertaining each class for anywhere from 15 minutes up until the entire period, depending on what you and the teacher agree upon. So you want to make it fun for the teens – get them involved. Ask a question and get them talking. For example, when booktalking No More Dead Dogs by Gordon Korman, ask them if they have read Where the Red Fern Grows and how they felt when the dogs died. Take a portion of the book and make it into a short reader’s theater. Create a short news show or interview that ties into a book. Believe it or not, a lot of the same techniques your children’s librarian employs for story hour can also be successfully used in a fun, interactive booktalk. So make cards with words on them and ask teens to yell them out every time the you show them the card. Ask teens to sing, dance, act, and get involved. It doesn’t have to be you standing up in front of them. In fact, it doesn’t always have to be you at all. Today most classrooms have a computer and an overhead projector in them, so take advantage of this. Download book trailers onto a flash drive and share them. You can download a wide variety on YouTube or at various publishers sites, or visit Naomi Bates and use hers (she also teaches you how to make your own). You can also create PowerPoints or basic images to share and give that “wow” factor. I find these to be particularly useful when I want to booktalk a book that is never in on the shelf – this allows me to show them the cover. In fact, I now almost always create a visual presentation to go with my booktalks. The visual reinforces the verbal. Plus, I can leave it behind in the classroom for the teacher and students. Check out the August 2011 edition of VOYA, it has a good article on alternatives to the traditional slide show. Scholastic also has some video booktalks you can use. Multnomah County Libraries have a variety of Podcasts available online. There are a lot of great tech options out there to tech up your booktalks. Teachers are always looking for creative ways to help students explore literature and share what they have read, so get the students writing their own booktalks and creating their own book trailers. You can share what they do in the classroom in a wide variety of ways in your library with the proper permissions and platforms, such as on a web page or social media page or display screens in your teen area. I have always been amazed when visiting the classroom how students will write down titles and come up and ask you about them. If you can, find a way to check titles out to the students at the end of the day. I have written down book barcodes and library card numbers and gone back to the library and checked them out. But what if the teen doesn’t have a library card yet? Chances are, they are going to come in to the library and ask about the book – but they won’t remember much. So you need to make sure all public service staff know not only that you visited a school and booktalked, but what you booktalked. Make sure all staff have a list of the books, a copy of the cover so they can know what it looked like, and a general book description (or a copy of the actual booktalk). You can do this electronically or in print, or both. Then, when a teen comes in and says, “this lady came to our library today and talked about this book set in the future where everyone has a job given to them”, the staff member can pull out the list and determine that it is The Giver by Lois Lowry. Teens are satisfied, co-workers feel informed and everyone walks away having a successful library interaction. That is always our number 1 goal. Also, if you make slides you can print them out and put them on display in your teen area. And if the books are in you can put them on display. Whatever you do, you want to make sure they can check out the book (buy multiple copies!) or put them on hold. There is nothing worse then coming into the library to ask for a book and there is no one there who knows what you are talking about. Also, don’t forget your school librarians! Take the information to them and introduce yourself. Chances are some of the students will go looking for the books at their school library, so help the school librarian find them there if the school owns them. We want teens to have successful library experiences, whether it be your public library or their school library. If you deal your cards correctly, you can establish a good repeat customer relationship with at least one teacher – and if you visit one teacher’s class room every month for 6 or 7 periods, well that is a lot of booktalks. At one library I worked at I visited one particular teacher’s classroom every month for 5 years. The great thing about this is that after a year, you have a really good backlog of booktalks to draw from the next year. All you have to do is add the new books that you read. And that teacher, she could be counted on to spread the word to other teachers who would occasionally take me up on my offer. Best of all, it was amazing getting to know those students throughout the high school years. So good luck to you as this new school year starts. Now get booktalking!